Always a new challenge. This week our awards show designed to run on the San Francisco Giants AT&T Park stadium main display was a success (Yay TLC design team!). We did an internal project to have a visual sample for client conversations about slide transition looks. The video, developed and exported from PowerPoint 2013, shows every transition – and every transition option in PowerPoint 2010 and PowerPoint 2013. I have been in Atlanta this week on a great show. Backstage graphics area was loaded with an array of computers for PowerPoint, Keynote, Prezi and background GFX. Onsite in wonderful warm Southern California (Laguna Cliffs Marriott) this week for a National Sales Meeting handling all of the presentation design and execution. The slide development required first getting the visual elements approved. Then, developing the animation and having it approved. The animation is deceptively simple with a few motion paths on each slide. But it also required exact pixel accurate placement of each visual for seamless slide-to-slide animation and careful attention to the layer order of the elements. Happy New Year From TLC Creative Services! 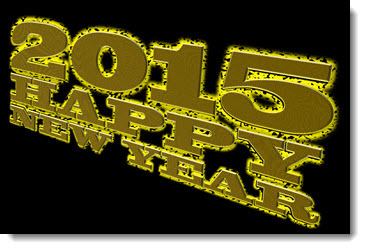 Our design team here at TLC Creative Services hopes your 2015 begins great and is full of fantastic design! We’re celebrating with you, and this fun PowerPoint slide that has text treated with bevel, 3D perspective, texture fill, outer glow, outline and some great animation. Start of new year, start of lots of great new projects and time to take down the holiday lights! TLC Creative Services has a team of incredible presentation designers ready for 2014!